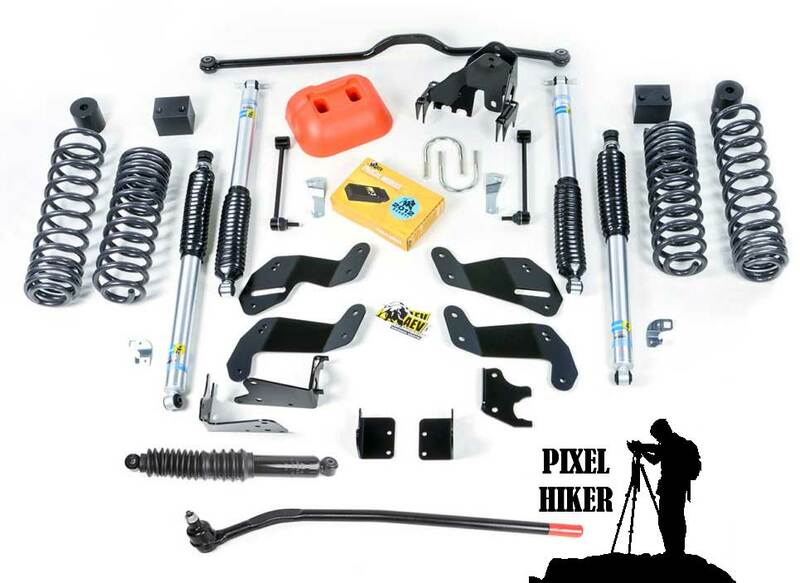 I have spent many hours reading forums, blogs amd manufacturers information regarding Jeep JK Wrangler Lift Kits in an effort to find a lift kit that best suits my needs. What are my needs you ask? On the surface they seem simple but I learned they aren’t once I started to dive in. I’m going to be honest the first need is appearance. My 2018 JKU is beautifully boring and I want my Jeep to look more aggressive. That aggressive look comes from more ground clearance and taller, wider tires. There are many ways to achieve that look but there’s additional considerations. A body lift or budget lift easy easy to install, inexpensive and other than a higher center of gravity it doesn’t change the handling characteristics of the jeep. Unfortunately I do want to change the way my Jeep handles both on and off road. That means I need a suspension lift which also changes the geometry of the vehicle. That geometry change often means a vehicle that works great off road can beat you up on every day driving. These changes can also make the vehicle harder to control on highways at speed. In my youth I spent a lot of time driving a lifted monster wheeled Jeep and a Dodge Power Wagon with 44″ wheels. The Power Wagon was a bear to drive and required a lot of correction to try and keep the vehicle traveling in a straight line. I can’t have that, my Jeep needs to remain highway friendly not just for me but for the other driver in my house, my girl. Off road use is actually my last criteria because I live in Connecticut we simply don’t have much land available to the public for off road use. During winter I can experience deep snow, while warm weather hiking, fishing, photo excursions and mountain biking can send me off road in most cases it’s terrain even a stock jeep can safely navigate. Connecticut is a mall crawler state by default. Of course when I travel to New York’s Adirondacks or Vermont or New Hampshire I can do real jeep stuff but those trips are infrequent. Fortunately all my research lead me to the conclusion that there’s a single lift kit that will give me the look I want and actually improve the street handling of my jeep while making it more than capable for any off road adventure I am willing to take on. For my needs the best lift kit is the AEV 3.5″ DualSport SC Lift Kit Part Number N0234100AA for the JKU Wrangler. American Expedition Vehicles (AEV) is the supplier to lift kits for Chrysler Jeep. AEV lift kits are original equipment on factory lifted jeeps. They have been tested extensively by Jeep. American Expedition Vehicles also has a staff member who was an engineer at Jeep. 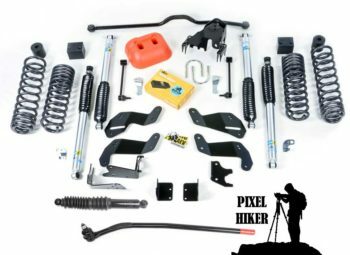 AEV knows Jeeps, Suspensions and lift kits, this is why I am purchasing and installing the AEV 3.5″ DualSport SC Lift Kit. The AEV 3.5″- 4.5″ DualSport SC Lift Kit is a best of both worlds lift kit. The AEV 3.5″ DualSport SC Lift Kit improves the road handling and ride of a Jeep Wrangler JK/JKU while also making the same Wrangler a capable off road vehicle. I have explained why for my purposes and my 2018 Jeep Wrangler JKU the AEV 3.5″ Dual Sport SC Lift Kit is the best lift kit but that doesn’t mean the kit is perfect or complete. My research has shown me that not every part of the AEV kit will be used as their are other areas that can be improved and there’s additional hardware to not only make my Jeep JK Unlimited even better but I can also eliminate any potential for the death wobble Jeeps are known for. I will spell all that out on another page. Lastly to install and make use of the AEV 3.5″ Dual Sport SC Lift Kit requires that aftermarket wheels and tires also be replaced at the same time. The AEV 3.5″ Dual Sport SC Lift Kit cannot be used with factory wheels and tires. AEV’s DualSport Suspension Systems have taken off-road suspension engineering to the next level. At American Expedition Vehicles, suspension development is about more than just adding lift height, articulation, or flashy-looking components. It’s about bringing OE-level suspension engineering to the aftermarket to create a true do-anything “dualsport” suspension – one that is both extremely capable off-road, while offering unparalleled on-road performance and handling. To achieve this, American Expedition Vehicles relied on factory engineering methodology. We started with the JK’s control-arms, track-arms and steering. The geometry of each component was optimized to accommodate the new lifted posture of the JK. It may surprise people to learn that proper geometry is where AEV’s Dualsport Suspensions get much of their tremendous cornering and braking characteristics. The fact is, when the geometry is right, the springs and shocks don’t have to compensate for poor performance in these areas. The factory wheels will not have the correct offset to allow you to use them with our 3.5/4.5 DualSport Suspensions. Aftermarket wheels are recommended both for adequate width to mount larger tires and decreased backspacing for chassis and steering clearance. Any AEV JK Wheel will solve the clearance issue, or set of 1.0″ thick wheel spacers with the factory 17″ or 18″ wheels. This is always a tricky question because there are so many factors involved such as wheel width and offset, body/fender modifications, spring rates and bumpstop spacing, etc. The short and simplified answer is that if running our wheels (or dimensionally equivalent), we recommend a 35×12.50 tire with our 3.5″ kit, and a 37×12.50 tire with our 4.5″ kit. That said, each kit can accommodate larger tires and it becomes a personal decision based on how the vehicle will be used and whether you’re willing to put up with any tire rubbing.